Thanks mostly to his famously explosive temper and natural affinity for the culinary arts, Gordon Ramsay has become a household name in the States and his native Britain. However, few people know of Ramsay’s extremely humble beginnings and that prior to becoming a multiple Michelin star holding chef and one of the wealthiest people in the world, he had a relatively promising career playing soccer. Born in Scotland in 1966, but ultimately raised in Stratford-upon-Avon (the birthplace of William Shakespeare) after his 5th birthday, Ramsay’s upbringing was pretty miserable. Growing up in government subsidized housing and living in constant fear of his alcoholic, abusive father, Ramsay has had precious little positive things to say about his childhood over the years. His father, along with being violently alcoholic, was also a noted womaniser who struggled to hold down a job, leading to Ramsay noting that there were occasions in his childhood he simply went without food when his dad “did a runner”, leaving his family with no money and nothing to eat. 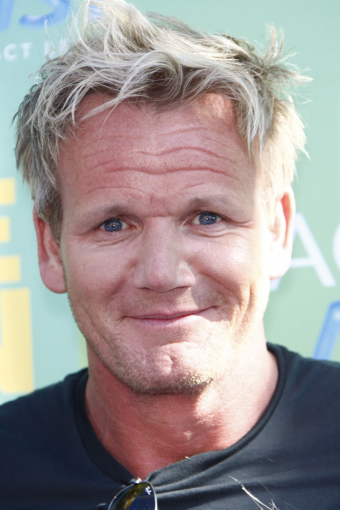 Before moving on to something less depressing, it’s also worth noting that Ramsay’s father was also named Gordon and the chef has claimed that he still to this day gets letters from debt collectors and people his dad owed money to asking him to pay up, despite that his father died in 1997. One positive outlet Ramsay had in his youth was soccer, something he became incredibly proficient at, being scouted to play for his county at age 12, playing for the under 14s team. Despite his talent at the game, Ramsay’s aggressive playing style saw him frequently succumb to injuries, leading him to later note that his soccer career was “doomed” from the start. Despite his injuries, he was nonetheless scouted by the Scottish team he’d supported as a child, Rangers F.C. in 1984 as part of their youth program. The extent of Ramsay’s association with the team has been the subject of much controversy with Ramsay initially claiming in a 2002 radio interview that he played 3 games with the club’s first team before a knee injury put an end to his soccer-playing dreams. Soccer buffs quickly refuted this claim and pointed out that the coach Ramsay claimed to have met and spoken during his brief soccer career worked for a different team at the time. After being repeatedly pressed for comments, a spokesperson for Ranger’s F.C. armed with evidence from their archives explained that although Ramsay had indeed been associated with their club for a brief period in the 1980s, he’d only ever played a single testimonial match for them as a trialist. The spokesman, however, did confirm that Ramsay’s association with the team was ended when he suffered a severe knee injury, which Ramsay exasperated by playing squash against the advice of doctors. When celebrities occasionally get something wrong about their own history, many tend to accuse said individual of intentionally lying. But in regards to the inconsistencies in the recollection of his soccer career, Ramsay released the following, very reasonable, statement, which likely is the real reason many in the public eye get such details wrong about their own pasts: “Any inaccuracies regarding the details of this period can be explained by the fact that all this occurred nearly 25 years ago…” The human brain and our amazingly prevalent false memories and all that. Although he never played a league match, Ramsay has remained an avid soccer fan and continues to take part in charity matches with other celebrities in addition to running marathons, giving him what he describes as “calves that feel like loaves of foie gras”. A writer for the New Yorker who was invited by Gordon to feel his calves for themselves would later say that this description is inaccurate and that the chef’s calves are more akin to “oversized bowling pins”. His soccer dreams dashed, Ramsay turned his attention to another burgeoning love of his- cooking. Raised on a diet of cheap, tinned or frozen food as a child, Ramsay had grown to intensely dislike processed food as an adult and it showed in his zeal for cooking. Ramsay’s first cooking related job was working part-time in a pub kitchen, a job he got thanks to his father, who had variously worked as a pub musician in the past. Going into like sort of hotel catering was an excuse to get out of the scenario quickly. Mum and dad were going through a divorce. I’d split up from my girlfriend. And all of a sudden you know not a pot to piss in, ah, broke, and I thought, well catering – I can travel, I can travel the world, study for two years and then get out of this country because I hated it. Ramsay tracked down White, who at the time was one of the best chefs in the entire country, and somehow convinced him to give him a job at his restaurant, Harveys. Over the next two years, Ramsay went from only being allowed to cut vegetables to basically running the entire kitchen, becoming an incredibly competent chef in the process. Along with teaching Ramsay most everything about the business of cooking and being a chef, White also seems to have taught Ramsay the art of berating one’s employees, infamously making Ramsay collapse into a puddle of tears. While the exact circumstances around the incident are hazy, White stated that after yelling at Ramsay one shift, “Gordon crouched down in the corner of the kitchen, buried his head in his hands and started sobbing.” Needless to say, Ramsay eventually had enough and quit. Though Ramsay still claims to respect White for giving him his break and teaching him so much about cooking, stating, “I wouldn’t be where I am now if it weren’t for Marco”, the pair’s relationship is strained at best and they’ve spent years trading barbs in interviews and books. After leaving White’s employment and working briefly in another London restaurant, Ramsay travelled to France to hone his craft, spending several years studying under esteemed chef Guy Savoy. Later, he took a cushy job as a personal chef aboard a yacht in Bermuda. In 1993, Ramsay, refreshed and armed with a wealth of new knowledge returned to London where his former mentor, Marco Pierre White offered him a job running a restaurant called Rossmore, which was later renamed “Aubergine”, for a 25% stake in it. Despite finding immediate success with the venture (the restaurant won a Michelin star just 14 months after Ramsay started working there), Ramsay’s relationship with White and the financial backers was a source of constant aggravation. Ramsay claims that the the backers and White repeatedly attempted to force him out, making his life difficult seemingly just to spite him. Notably, while working at Aubergine the restaurant’s reservation book was inexplicably stolen by a man on a scooter, causing chaos for several weeks. You see, this was before computerised records were the norm in restaurants and the reservation book contained every booking Aubergine had for 6 months. Owing to them stupidly not having backup records, its theft could have crippled the restaurant. However, helpfully, the thief decided to troll Ramsay by intermittently faxing over pages from the book over the next few months, adding the occasional wrong booking to keep him on his toes and always spelling his name wrong to annoy him… Or at least, that’s how it seemed to happen. F*ck all. But it hurt him. It was my one stroke of genius, f*cking someone over without his knowing that I was the one who done it. And the Italians cutting Marco off and wanting to get closer to me, kissing my a**—‘What do you suggest? Can we sit down and start negotiating again?’ You always eat that f*cking revenge when it’s cold, don’t you? Trust me, this was stone cold. Oooh . . . even now it sends a chill down my spine. Because it would have been all over if I’d been caught. But that’s the risk you take, isn’t it? A few months after the theft, upon hearing that the other owners wanted to turn Aubergine into a chain, the entire kitchen including Ramsay quit. To really rub it in, Ramsay vandalised the kitchen and then hired every member of staff who’d quit to work in his brand-new self named restaurant, “Restaurant Gordon Ramsay”. I looked at a clip and I saw I needed controlling. I don’t regret making [Boiling Point], because that was me at that time. But I was shocked. No one had ever shown me, me in real life. But it was the wrong me. I don’t want to sound like a sad f*ck, because the film opened so many doors for me, but it was the wrong me. Despite the show making him out to be a violent screaming maniac, it boosted Ramsay’s profile considerably and his phone rang “off the hook” for months after it aired, effectively launching his now extremely lucrative television career, which has also helped him open more high profile restaurants. Thanks to all this, today Ramsay’s net worth is generally estimated at just over $100 million, he owns a dozen restaurants around the world and is considered one of Britain’s, if not the world’s, finest chefs. From Attempted Suicide to MLB Superstar-The Life and Very Complicated Times of Ken Griffey Jr. So did Gordon Ramsay ever play for Rangers?